Run some basic and meta sensitivity measures on the example fMRI dataset that comes with PyMVPA and plot the computed featurewise measures for each. The generated figure shows sensitivity maps computed by six sensitivity analyzers. 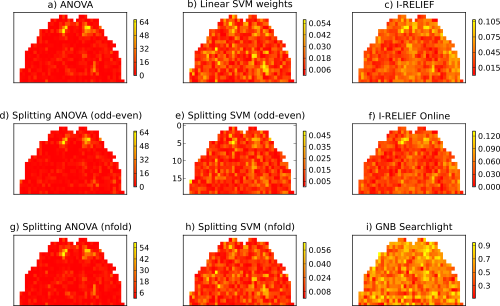 We start by loading PyMVPA and the example fMRI dataset. As with classifiers it is easy to define a bunch of sensitivity analyzers. It is usually possible to simply call get_sensitivity_analyzer() on any classifier to get an instance of an appropriate sensitivity analyzer that uses this particular classifier to compute and extract sensitivity scores. Now, we are performing some a more or less standard preprocessing steps: detrending, selecting a subset of the experimental conditions, normalization of each feature to a standard mean and variance. Finally, we will loop over all defined analyzers and let them compute the sensitivity scores. The resulting vectors are then mapped back into the dataspace of the original fMRI samples, which are then plotted. The full source code of this example is included in the PyMVPA source distribution (doc/examples/sensanas.py).